Dance Suite from "Terpsichore (For Brass Quintet). 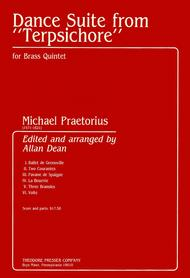 Composed by Michael Praetorius (1571-1621). Edited by Allan J. Dean. Arranged by Allan J. Dean. Brass quintet. For Trumpet I, Trumpet II, Horn, Tenor, Tuba. Score and part(s). Standard notation. 20 pages. Duration 8 minutes, 45 seconds. Published by Theodore Presser Company (PR.114404300).With Standard notation.